Time to Replace Your Formula Boat Canvas? Formula Boats pride themselves on being different. A difference resulting from fine-tuned design, authentic craftsmanship and a companywide insistence on excellence. You knew this when you purchased your Formula boat. In fact, it’s specifically why you wanted to be a Formula owner to begin with. Ameritex is the company that Formula has chosen to provide canvas for their boats as they ship from the factory for almost two decades. They chose Ameritex because we have a commitment to those same standards of design, craftsmanship and excellence. When the canvas top or cover on your Formula wear out – which is just something that happens after years of exposure to the elements – choosing Ameritex to provide replacement parts identical to those that shipped from the factory is, by far, the best choice you can make. Only Ameritex can provide the same parts with the exact design and fit. 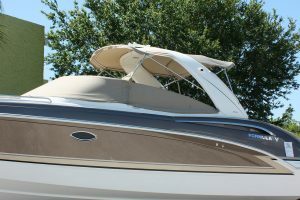 Only Ameritex worked with Formula’s engineers to develop the perfect canvas for your boat. Only Ameritex canvas will provide the styling and protection that you wanted when you purchased your Formula boat, and that you want to maintain for the foreseeable future. With a long-established philosophy of uncompromising quality in every detail, Formula is recognized as one of the world’s premier powerboat manufacturers. It’s an investment. An investment you take great pride in. Ameritex is proud to provide the original canvas for Formula boats, and we’d be even more pleased to help protect your investment for years to come by re-manufacturing replacement canvas for your boat now.